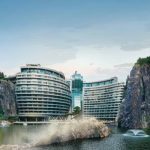 One of the world’s leading hotel companies, announced the grand opening of InterContinental® Shanghai Wonderland, the 200th InterContinental hotel making InterContinental Hotels & Resorts the world’s largest luxury hotel brand. 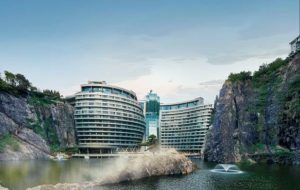 Developed by Shimao Group and managed by IHG, InterContinental Shanghai Wonderland is a luxury hotel masterfully built into the side wall of a formerly abandoned quarry in Southwestern Shanghai. Stretching 88 metres underground, the hotel was nominated as one of the architectural wonders of the world by the National Geographic Channel’s MegaStructures series due to its pioneering architectural design. Founded in 1946 by aviation pioneer, Juan Trippe, InterContinental® Hotels & Resorts have been on the forefront of luxury hospitality industry for decades with a portfolio of 200 hotels and resorts in stunning locations around the world. To celebrate reaching 200 destinations, the InterContinental brand partnered with London-based contemporary artist Alexander Hall, also known under the alias Haut de Gamme©, to create a stunning art installation, commemorating the milestone. The art installation is made from 200 champagne bottles individually hand-painted by Alexander Hall in his bright and energetic drip-style, with unique artwork on each bottle inspired by each destination. The finished bottles are suspended together in a stunning oeuvre to reveal the number ‘200’. Continuing the brand’s dedication to providing high standards of guest service and delivering captivating destination experiences, InterContinental Shanghai Wonderland offers services and facilities signature to the InterContinental brand. The award-winning InterContinental Concierge adopts the brand’s “In-the-Know” approach and features a series of curated experiences to help guests discover the beauty and charm of the destination. Located right above water level in the hotel’s rock quarry architecture, the Club InterContinental lounge offers an exclusive venue for social gatherings and business meetings, and a range of exclusive services and benefits for its guests.